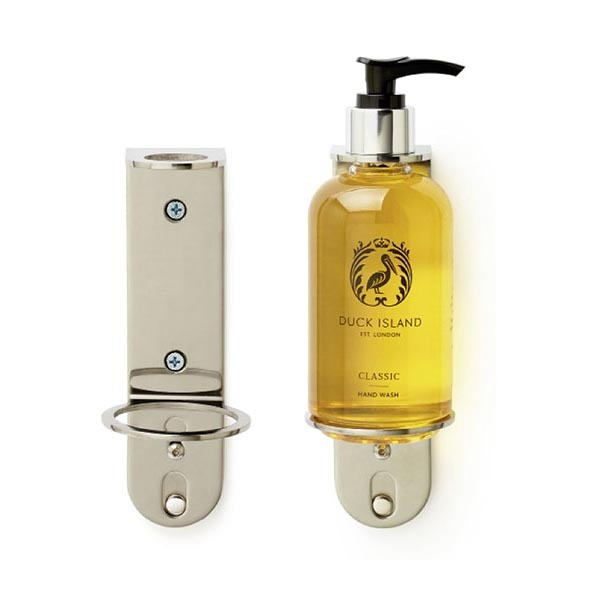 Duck Island single Wall mounted bright chrome security bracket to hold the 250ml bottles of Duck Island toiletries. Dimensions: 41mm (W) x 164mm (L). Quantity: 1 Bracket per case. Duck Island products are not tested on animals and the formulations are examined and certified by an independent specialist laboratory to give peace of mind. Wherever practical everything is recyclable. Matching products available are:- Bath Foam & Shower Gel, Conditioner, Body Lotion, Embossed Soap, Liquid Hand Wash, Moisturising Hand Cream, Shower Cap, Sewing Kit, Shoe Shine, Vanity Kit, Presentation Tray and Wall Mounted Security Bracket.